Headaches wreck your day? Do your feet make walking a challenge? Your back and knees hurt? Our custom foot soaks contain medicinal herbs and mineral salts used for centuries to revive our bodies and reduce pain. Check out the clinic’s “grocery shelves” in the reception area next time you’re at the clinic. 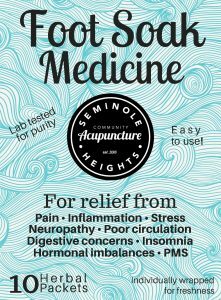 We now offer our own therapeutic foot soak herbs in packets for convenient preparation and clean up. These are specially grown and prepared therapeutic herbs and part of a farm-to-clinic program that funds the school library at an orphanage in rural western China. 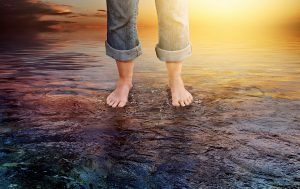 Adding foot soaks to your self-care is for many people an effective way to speed recovery. Our formula is a classic traditional medicine meets modern technology story: the herbs are hand selected and harvested. Then they are tested with contemporary lab techniques, assessing purity, measuring active ingredients, as well as assuring optimum harvest time and plant selection are at their peak. Out of the bag, our foot soaks are an effective way of treating with herbal medicine, and without going through the digestive tract! Did you know you can customize your foot soaks? 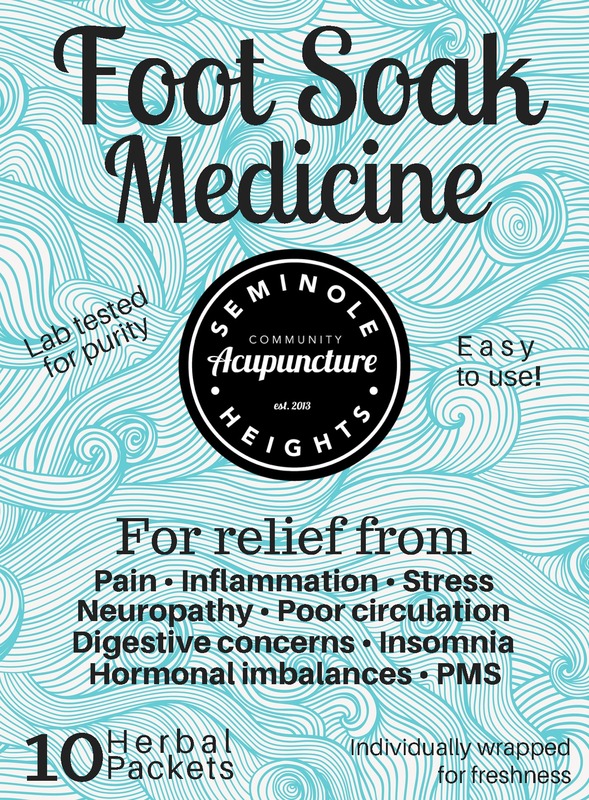 By adding some kitchen basics you probably have stored in your pantry, you can personalize your foot soak to direct the treatments to parts of the body or specific tissues within the body. 1. To soak or not to soak? As you soak your feet, you may feel your body warming and actually break a sweat. Mild sweating is essential to a good soak and suggests you have opened up the circulation. But excessive sweating consumes energy, so you should end your foot bath session if you feel you’re sweating too much. The optimal time for foot baths is just before bed, which will have the added benefit of helping you sleep. And the best way to follow up a foot soak is with sleep or a foot massage! Foot soaks are a traditional Chinese self-care method, particularly popular in cooler weather. And they offer an effective way to treat the body with medicinal herbs without depending on our digestive tract! First, decide whether you want to add anything to your foot soak water. Soaking with mineral salts, like Epsom Salt, can help relax muscles, relieve pain, and reduce inflammation. Gather a bucket or wash basin large and deep enough for both your feet, some towels, extra hot water to warm the soak after it cools, and find a place to sit. Add about 1½ cups of mineral salts to 2 gallons of very warm water (100-110 degrees F), enough water to fill the basin about 1/3 full. Make sure the liquid covers your ankles. Each person’s reaction to hot water is different, so start at a low temperature (100°F) and add hot water as tolerated. (REMEMBER! : take your feet out of the water before you pour in more hot water!) Soak your feet for at least 25-30 minutes your first soak. Place herbal tea bags in a half gallon of water in a soup pot. Bring water to boil and leave covered for 30 minutes. Transfer the hot herbal soak to your soaking pan or bucket. Add cold water to bring to a good temperature, adding 1-2 cups cold water at a time. Test the temperature of the water often as you cool the foot soak liquid. This liquid is very hot. If you’re able, hold your feet over the water to allow them to steam while the liquid cools. Once the liquid temperature is ~105 F, lower your feet and soak for 25 minutes. You can reuse this herbal liquid up to 3 times over the course of 3 days by saving the herbal soak and reheating to the appropriate temperature (without simmering). When you soak, keep a towel close by to dry your feet with when you’re done. Spend at least 20 minutes soaking. Though various health conditions will affect the length of time you should soak for optimal benefit. When your soak water cools, lift up your feet and add more hot water. Once the water cools and your time is up, be sure to stop soaking rather than linger in tepid water. Foot soaking is a simple practice, and it can have a great effect on your health. When we soak, our bodies rest and heal best because we are relaxed. So take a load off, and take the plunge!